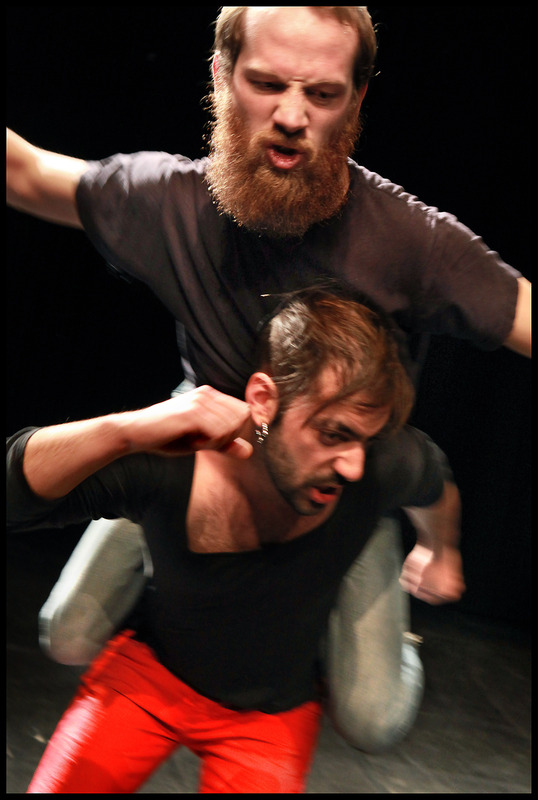 In the duet “Still standing You”, the Flemish choreographer Pieter Ampe and his Portugese partner Guilherme Garrido constantly try to surpass each other. The result? A very entertaining farce that gives not only a portrait of a friendship but also raises questions about the strengths and limits of the physical body. Already the first collaboration between Pieter Ampe and Guilherme Garrido learned that the vantage point of two naked man who challenge and fight each other on stage can garantuee for an interesting evening. In ‘Still difficult duet’, they introduced themselves as best friends but at the same time appeared both to be very keen on playing the first violin. The rivalry that thus entered the friendship unleashed a series of mean and underhanded harassments and ways of bullying each other: pretending a hug only to be able to strike harder, tweezing out a pubic hair,… The naivity but at the same time very controlled character of such ‘mischievous fun’ was unseen and therefore very refreshing. The dorky appearance and expressive mimic of the men made it all the more hilarious. Guilherme Garrido: a Southerner with tattoo’s and piercings and a wry grin to his face. Pieter Ampe: a milk-with Belgian with a red beard who tries very hard to look innocent but is betrayed by the naughty gleam in his pale blue eyes. For ‘Still Standing You’, they have not changed a bit. The opening scene of the performance sets the tone for a series of actions that will continue to develop in the empty black box. Entering the space, the audience is greeted by Garrido. He sits up on the outstretched legs of Ampe, who is lying on his back. That Ampe will not be able to hold Garrido for much longer can be deduced from his head that colours more and more red. Garrido seems unaware of this. With a big smile, he introduces his companion to us. It seems chummy but has a dirty edge to it. In this scene, Garrido uses his friend as a stand, just like a sculpture that gets its authority from standing on a collumn. Ampe seems to be willing to support his friend in this way, but is that really true? In the physical oriented context of a dance performance, you could just as well claim that it is Ampe who uses Garrido for showing off his muscles and physical strength. Or is that precisely what Garrido had in mind and was he counting on the bluff of his partner to provoke his failure, because off course Ampe cannot hold him forever… Whatever the case: one simple image and you’re plung back to where ‘Still difficult duet’ ended. Again, we’re back on the narrow edge between friendship and rivalry motivated by profilation urge and jealousy. The toss-up of an intimate relationship between two men, where hugs and praises go hand in hand with shameless banter and nasty jokes. Despite the resemblances between the two performances, ‘Still difficult duet’ and ‘still standing you’ differ on important things. The former unfolded like a crazy cat and mouse game between two dorks. The references to typical dance movements-for example the scene where Garrido tears out a pubic hair of Ampe as the latter shows us a perfect classical dance Arabesesque- gave the piece the character of a parody or a free Spielerei around the genre of the ‘duet’. ‘Still standing you’ has the same drolly quality but has a bit of a more investigative tone then its predecessor. More than just a gimmick that shows what might happen when you in a classical pas-de-deux replace the ballerina by a guy (relevant in a dance world that increasingly becomes a male world), the theme of male rivalry and individual profiling serves here in the first place as a bridge to a multiplicity of references and ideas. Take the scenes where Ampe and Garrido are roaring against each other, reminding us of adventure movies. “Still standing You” seems here to tend at a social study of primitive (male) behaviour, where pride and eagerness to profilie oneself are really dealing with status display, leadership disputes and the ptrotection or delineation of an imaginary territory. Another interest that manifests itself is an investigation in the physical boundaries and limitations of a body in its physicality and in the confrontation with another body. This is revealed in a series of acrobatic moments, for instance the opening image. Innitially, the rivalry drives them into a game to go to the utmost limits of what their bodies can bear, without sparing each other. Later, the duo seems more interested in eliminating the boundaries between them in a search for fusion or liquefaction. That makes up for some very nice images. At one point, they weave their bodies together so that suddenly a strange creature with four legs appears on the stage. Very intruigining! Nonetehless, such fascinating images can’t make up for the unclear intention of the piece. The weak point is the serial succession of the rivalry ‘actions’. In the cat and mouse story of ‘Still Difficult duet ” this was useful and consistent. In ‘Still standing you’ however, this structure supports the feeling that the show lacks a clear intention and wants to go into different (too many?) directions without going there all the way. Altough more thought-provoking, ‘Still standing’ shows itself therefore less coherent than its predecessor: a study in fact more than a ‘finished’ product. And why would we be interesting in seeing that? Ampe and Garrido are young artists. With ‘Still standing you’, they allow us to follow how they continue to work on their artistic research and interests. The art center Campo in Ghent gives them all the means and freedom to do so. ‘Still Difficult duet “was a hit: the energy and physical language of Ampe and Garrido was unseen, funny and seductive. It would be foolish not to continue working on that. Furthermore, there is nothing amusing to watch than other people trying to surpass each other, this never gets boring, so we don’t mind having that served one more time. But the surprise effect of ‘Still Difficult duet’ has been lost, of course. Does this get replaced by something? For those who are interested in the research process of Ampe and Garrido, this piece is very insightfull. For those who did not get a chance to see ‘SDD’, this piece gives a second chance to get introduced to the interesting proposition of Ampe and Garrido. For others, this may be a disappointing ‘been there, seen that’- experience. But well, every battle has its ups and downs.. so, up to the third round?